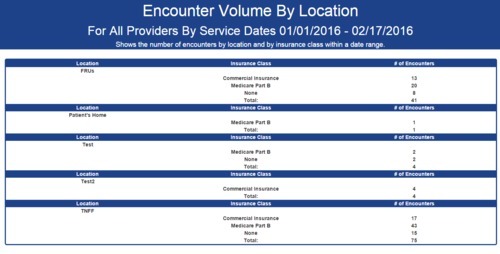 The Encounter Volume by Location report is an Advanced Report which displays the number of encounters by location and by insurance class within a date range. The Encounter Volume by Location report lists the number of encounters created at each location. Encounters will be grouped under a certain location based upon the Visit Facility on the encounter. The report will then break each location down further, listing the number of encounters by insurance class (e.g. Medicare Part B or Commercial Insurance). Location — The Visit Facility used on the encounter. The name of the location will display the Short Name (as found under Properties > Locations). Insurance Class — A further breakdown of encounters by insurance class. # of Encounters — The number of encounters seen at that location.